Seven Angels, Teeth of Lions Rule the Divine, Like Gold and Faceted: Due to the similar nature of all three ‘songs’ on this album, I will review them collectively. This album was released by Sub Pop (most notable as the first record label for Nirvana before they became famous) in 1992, and is the sonic template that nearly all future drone bands (in regards to rock/metal) would follow to one degree or another. Seven Angels opens the album with chugging guitar and bass, coupled with various feedback, both from the acoustic sources as well as electronic. This continues in various permutations, throughout the albums three songs, for seventy two minutes and fifty-three seconds. One of the several tongue-in-cheek ‘consumer reviews’ posted on the back of the CD cover re-issue enthusiastically declares: “…a physical presence in the room…I can almost touch the sounds” & “MY TENSION HEADACHES HAVE DISAPPEARED!” While I cannot personally assert the veracity of the second claim, the first one is quite correct, as it theoretically should be with most drone/doom/noise rock bands.The physical impact of the music can be quite impressive when played at fairly loud volumes (as is intended), although the music takes on a different aural aspect when listened on headphones, mainly because of the binaural stereo effect that is achieved when listening to any music on headphones. This is due to the fact that external objects in a room, the atmospheric conditions, and even the structuring of the inner-ear will prevent true stereo sound unless the music is heard from headphones. While the “song” structures (if they can be called structured) are reptetitive, it is structured as a type of meditative experience, where one loses their sense of the present moment as the chords and feedback slowly evolve into more complex permutations. In a sense, it can be considered “active ambience”, in which the music is not subtle, but achieves the same effect (tranquility/relaxed state) through guitar and feedback progression. Obviously, this “music” is not for everyone. The listener must commit most of their attention while listening to the album for the full “effect” to take hold, and it is understandable that not everyone will have the patience to listen to, in effect, a seventy-two minute song with the same handful of chords repeated ad infinitum. If you think all the above text sounds like a pharmaceutical drug pamphlet description, I would also remind the reader that the insert of the Earth 2 album has a picture of no less than sixteen different drug bottles, overflowing with pills (some of which were undoubtedly consumed by the band’s frontman, Dylan Carson, during the creation of the album). In conclusion, if you are looking for a challenge, this is one album that should satisfy that desire. 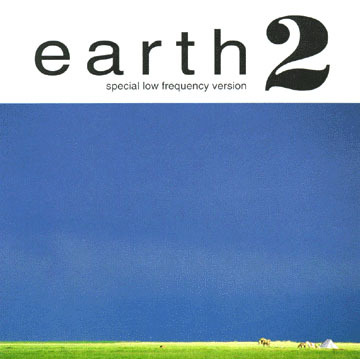 Earth would continue to create albums, although none would come close to matching the accomplished musicianship on this, their debut album. Well, I finally got around to posting another review, hope you enjoy it. This was a review that I wrote a few months ago (edited mostly for embarassing grammar problems and the occasionaly awkward phrase). Lately I have been going over a lot of new (for me, at least) underground bands in a variety of genres, so hopefully several new reviews will be arriving relatively soon (time permitting, of course). ~ by John Lithium on September 26, 2006. This entry was posted on September 26, 2006 at 6:45 pm and is filed under drone metal, Music For The Rest Of Us Archive, Southern Lord Records.You can follow any responses to this entry through the RSS 2.0 feed.You can skip to the end and leave a response. Pinging is currently not allowed.